Despite comfortably in the lead as the highest grossing film of all time at the box office and being nominated for nine Academy Awards back in 2010, Avatar has become a widely admonished work and thus finding enjoyment in it almost feels embarrassing and shameful. Essentially, loving this film is the cinematic equivalent of dating an absurdly gorgeous girl in high school, but your best friend hates everything about her personally. Are you honest with your buddy and admit to your relationship, citing the fact that you think she is hot as your reasoning behind the decision? Or do you keep things quiet, waiting to meet up with her at night after pretending you need to go home? On a purely aesthetic level, no one would argue with the attraction. Hell, you are lying to yourself if you don't admit to it. Avatar is a technical masterpiece, the very definition of a reference quality achievement, the ideal disc to pop in if you want to show off the capabilities of that amazing new flat screen you just put on your wall. However, the narrative feels drenched in familiarity as the story feels as if it has been done numerous times previously, and also I can't help but imagine James Cameron with a giant evil grin on his face as I watch, literally whispering in my ear how great he is and how important his work is for cinema. Without a doubt something else feels in play here beyond humble craftsmanship and storytelling, like you can actually see Cameron's ego on display in every frame. Despite this, I am here to say that I love the movie and I, for one, am not afraid to admit it. If Avatar is the most jaw dropping girl in school, then I would have gladly held her hand and walked down those hallowed halls with a dumb, proud smile on my face. Why? Because I am so damn entertained the entire time I experience this film, even while knowing and accepting any flaw that I previously mentioned. I would never marry her, of course not. I need far more interesting depth and substance to spend my life with a person, but for the occasional fling you can do far worse than a mindless viewing of Avatar. 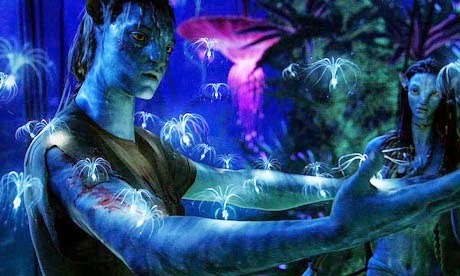 Just sit back, relax and tell James Cameron to take you deep into Pandora. Reading back that last line, it sounds even more perverted than I imagined. Forgive me. I love Avatar too (especially since it came out around Avatar: The Last Airbender and I'm so glad that it pushed that movie out of everyone's mind) and yeah that last line was awesome! James Cameron going deep. Anyway, I never understood why everyone hates James Cameron, maybe because he's almost always super successful? I mean Titanic is a great film, but everyone hates it because it's a romance story. Avatar pretty much revolutionized 3D and is a solid story, and yet people will always say it's copying Dances with Wolves or something like that. If you look through his filmography, the only film on there that might be a dud, is paranah II or something like that. I really like James Cameron, and he's created so many iconic movies that I can't wait to see anything by him, heck even his documentaries are interesting. I don't understand the Cameron hate either. The man has directed two of my favorite sequels ever made in Aliens and T2, it's really difficult for me not to appreciate someone who shaped my cinematic existence as a child so much. I think it does have something to do with success, that because a name comes up when trivia questions regarding box office are asked, people want to tear down anything that is too "popular".